What a difference a few issues makes. This time, we’re on the right track, regardless of two issues being skipped. Proof positive of this: it’s my 47th blog of comic-a-day and I’ve somehow managed to snag a 47th issue. The New Mutants are unconscious in Magik’s realm of Limbo, and the only one awake is the only one deathly afraid of such a place: Sunspot. Magik is spotted quickly by some denizens of this realm and make away with her. Sunspot tries in vain to activate his mutant powers, but after some internal monologue of her evil nature, follows them anyhow. 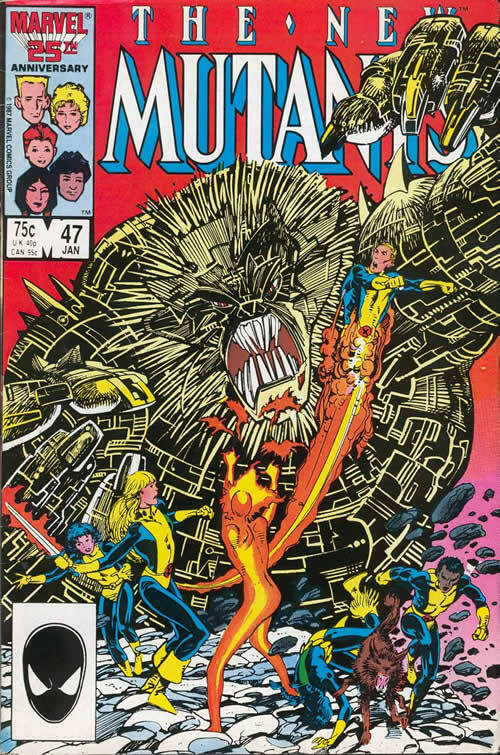 Magik is placed on an altar while Sunspot watches powerless as the demons plunge her sword into her chest. It’s just a flesh wound. As Magik and Sunspot get the band back together, they find that Warlock’s fear is ultimately so great that it bypasses Mirage’s powers and she projects a mental picture of his father. Turns out the team is escaping the clutches of Magus, Warlock’s father, who he must destroy if he is to live. (Wow, these teens sure have issues…) Cue daddy. In a brief fight where Magus turns a few of Magik’s lackeys to dust, Magik uses the distraction to teleport them to the Highlands of Scotland where they meet up with none other than Robert the Bruce. Not sure where this all fits in, but overcoming great odds seems to be our theme here. Again, I’ve not read any of these issues previously (I mean, maybe paged through one or two) but the interaction between Rhane and Robert are weirdly familiar. Seeing Sunspot change for the better over the culmination of the last few issues is refreshing–more confident and willing to be a team player, but still with the air of superiority. Maybe even Warlock leading off of the familiar yellow belly of his techno-organic make-up?